This "Historically Speaking" column was published in the Exeter News-Letter on Friday, June 8, 2018. June 14th is Flag Day. “What?” you say, “Another patriotic holiday in an already busy time of year? Who made that decision?” Calm down, there’s ample history behind the date. The flag of the United States was adopted by resolution of the Second Continental Congress on June 14th, 1777 : “Resolved, That the flag of the thirteen United States be thirteen stripes, alternate red and white; that the union be thirteen stars, white in a blue field, representing a new constellation.” The resolution wasn’t too specific on how the stars were to be arranged or whether there should be six white and seven red stripes or the other way round, but there was a war on, so who had time for details? During the next century, there were a few times a Flag Day was proposed, but it didn’t become official until 1916, when President Woodrow Wilson declared it a ‘Day of Observance.’ In 1949, Congress agreed and it is now observed each year. It’s not a federal holiday – like Memorial Day or Thanksgiving – and as such has to have a presidential proclamation each year. It seems that Exeter’s citizens just didn’t have time for yet another holiday during such a busy time of year. Flag Day falls mid-way between Memorial Day and Independence Day. There were also three school commencements to contend with – Phillips Exeter Academy, Exeter High School and the Robinson Female Seminary. We still feel that crunch today. One bright moment, in 2002, Main Street and Lincoln Street schools, comprised of grades K – 5, created their own patriotic flags and held the dedication on June 14th as a response to the September 11th terrorist attacks. It proved to be a comforting activity to kids slightly traumatized by recent events. 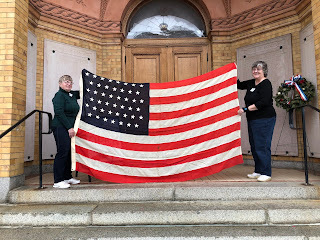 You might find a flag retirement ceremony on Flag Day, and although it might seem weird to go to an event that publicly burns the flag, rest assured, this is the appropriate way to retire old and worn flags. If you own a flag, this would be a good time of year to look it over to see if it’s in good repair. If your flag is dirty, it’s okay to wash it or have it dry cleaned (I once called my mother to ask if it was okay to toss a flag in the washing machine after mine got ‘bird doo’ on it. She said it would be more disrespectful to fly it covered in ‘bird doo’ than to wash it with the towels and socks. This is why mothers exist – to clear up these dilemmas.). You don’t have to burn your flag if it accidentally touched the ground – just pick it up, make sure it’s clean and fly it again. You’re not supposed to fly the flag at night unless you have a light on it, so try to bring your flag in at night. Also, bring it in if it’s raining. We’ve had a flag with 50 stars since 1960 – the longest period the flag hasn’t changed. Imagine yourself living in the early part of the 19th century when states were joining the Union every year or so. When James Monroe was president the flag changed five times. The good news is, you can fly any previous version of the United States flag. Minnesotans, for instance, might want to nostalgically fly the 1858 flag with 32 stars. It only lasted a year until Oregon joined and the 33 star flag was adopted, but in Minnesota I’ll bet they still love that 32 star version. New Hampshire was included in the first flag, so we don’t really get to play that game. We were the ninth state to sign the Constitution so on any flag our star is the ninth one. On the Betsy Ross flag, which was probably not designed by Betsy Ross, start at the top and our star is somewhere around 7 o’clock. In any event, flags are flying this time of year, so take some time to appreciate and care for it. Flag Day is a good day for that. 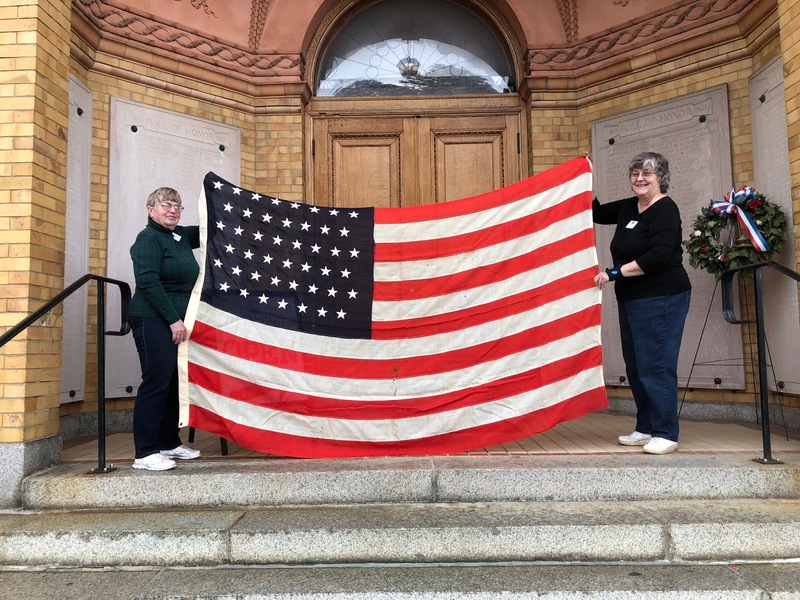 Image: Exeter Historical Society volunteers, Pam Gjettum and Vicki Lukas, enthusiastically display a 45 star flag from the collections. This flag flew from 1896 – 1908 when the 46 star flag was adopted at the time Oklahoma joined the Union.